Pot measures approximately 5-7/8" tall, 5-1/8" wide and is 14-5/8" in circumference (around its widest point). 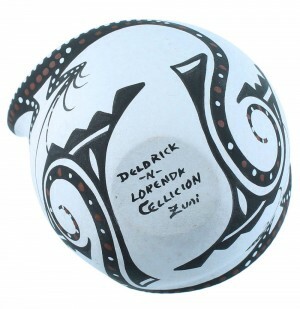 This spectacular Native American Pot is hand etched and hand painted, by Zuni artists Deldrick and Lorenda Cellicion. 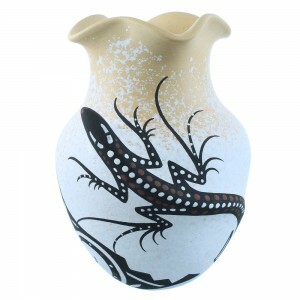 The vase is accented with delightful traditional patterns and TWO excellent gecko designs. 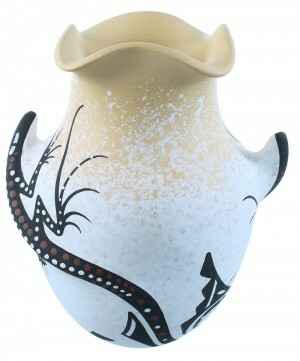 The pot is signed Zuni and by the artist.